Tae Kwon Do (Korean Karate) is a modern term first coined in 1955 by Grand Master Duk Sung Son, 9th degree Black Belt, founder and President of the World Tae Kwon Do Association (WTKDA). Tae Kwon Do taught in Traditional fashion utilizes non-contact sparring to ensure safety and teach non-violence. Grand Master Duk Sung Son is the author of two texts, Korean Karate: the Art of Tae Kwon Do (1968) and Black Belt Korean Karate (1983). He has been seen from time to time in Martial Arts magazine interviews. 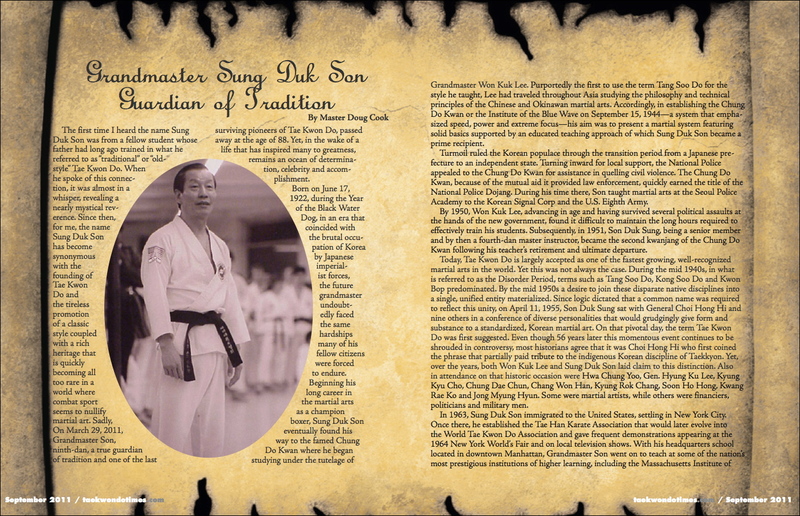 Grand Master Duk Sung Son personally taught all classes at the WTKDA Headquarters’ in NYC until his retirement. The WTKDA was the oldest and largest Martial Arts Association in the United States. His organization had grown to a level of over 450 schools. There were many Martial Art schools in Korea and the largest of the Kwan's was the Chung Do Kwan Institute with a membership of over 5,000. The other Kwans at that time were: Moo Duk Kwan, Yun Moo Kwan, Chang Moo Kwan, Oh Do Kwan, Ji Do Kwan, Chi Do Kwan and Song Moo Kwan. On June 25, 1950 war broke out and Grand Master Won Kuk Lee appointed Master Duk Sung Son as the second Headmaster of the Chung Do Kwan. Grand Master Won Kuk Lee's instructor in Japan was Gichin Funakoshi, the founder of Shotokan Karate. This is the origin of Traditional Tae Kwon Do. Grand Master Duk Sung Son retired in 2009. Five Points Karate, Master Bob Heckmann, 7th Degree Black Belt started studing Kempo Karate in 1973. 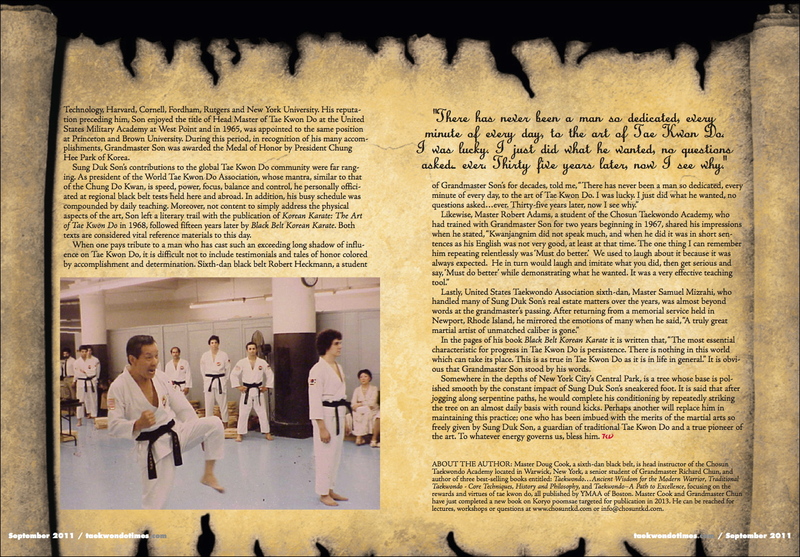 Tae Kwon Do in 1976, studying directly under Grand Master Duk Sung Son for Thirty Five years until GM Son retired. Then followed by Grand Master Dong Hoon Kim. 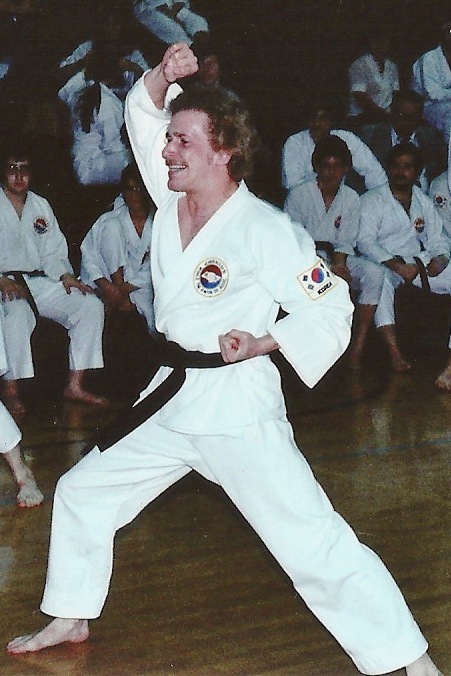 In 1987 earning a 3rd Degree Black Belt in Moo Duk Kwan - Tae Kwon Do under Grand Master Pong Ki Kim of the World Tae Kwon Do Federation. 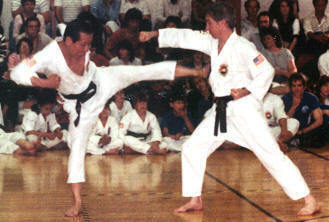 Bob started Tae Kwon Do with Grand Master Duk Sung Son at the Queens School in 1976, attending classes six days a week. In addition, Bob attended Wednesday afternoon classes at Fordham University in the Bronx with GM Son. As a Brown Belt, students were required to attend Friday classes at the World Tae Kwon Do Association Headquarters’ as a requirement for their 1st Degree Black Belt Test. In the 90’s, Bob attended Wednesday classes taught by GM Son in Poughkeepsie and Saturday classes in Westchester, in addition to classes at Headquarters’ in New York City. During the early years, Bob joined GM Son on Sunday’s for a 7:00am jog around the Central Park Lake, followed by a session of kicking The Oak Tree with Side Kicks and Round House Kicks. On occasion, this was followed by Three Step and Blocking Techniques. This is an integral part of Bob's routine. All classes and testing are still in accordance to strict guidelines set by Grand Master Duk Sung Son. Karate is more than self-defense, It is a Way of Life! Don't allow anyone to bully you anymore. Combat Obesity and the lack of physical activity. Build Confidence in the mind and body, inner peace and balance in daily life. Compete in Tournaments and participate in our Black Belt Summer Camp. Start now with the world's most popular Martial Art, TAE KWON DO. Daily workouts consist of: warm ups, basics, forms, sparring, three step and warm downs. No contract. No yearly Fees. Family discounts available. "Yes I Can" - Sammy Davis Jr.